We got our two kitties spayed on Monday, and Annelies and I have been watching them closely at home. This morning, they got away from me and I couldn't find them. 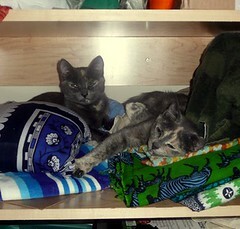 Ends up, like R. Kelly, they were trapped in the closet. Well, not quite trapped; they seem content. Hope they're doing well after their surgery.